Being a Keralite,Halwa or 'haluva' as it is generally pronounced,was a regular sweet we had.It was available everywhere and each had the same taste,in fact I am yet to try a Kerala Halwa which tastes different.Kozhikode Halwa the most popular among all,can be crowned as the King of Halwas,because it is a step above the rest.My favorite is the Karutha haluva,Black Halwa which simply melts in the mouth and makes you crave for more.There is even a whole street for Halwa,named Mittayi theruvu[sweet street] in Kozhikode which has shops exclusively for halwas,how cool! There are a few things which I feel are not worth trying at home,simply because the hard work involved is just not worth it when you easily get those items ready made.I would definitely add Halwa to that list. But we can try out simple halwas which do not require as much hard work and are easily made with just a few ingredients.I made this Banana Halwa when my batch of Nendrapazham had ripened and developed black skin.The recipe is unbelievably easy with just 4 ingredients and gets done in less than an hour. In a thick bottomed Uruli or a non-stick kadai add the sugar and water and heat until the sugar completely melts[you don’t need a sugar syrup,just heat it until no granules are seen]. Add the chopped bananas into it and give a good stir. Simmer the heat to the lowest and stir once in a while adding 1-2 tbsps of ghee as it starts browning. Once the halwa becomes golden brown and starts leaving the sides of the pan[approximately after 40 minutes] add the cardamom powder. If you are using a uruli,at this stage the ghee would start separating from the halwa. Pour the halwa into a greased stainless steel plate and level it with the back of a spoon or spatula. Let it cool completely and then cut into shapes of your choice. I halved the recipe and got around 14 pieces. I used a non-stick kadai and used less than the amount of ghee mentioned,hence the ghee did not separate from the halwa. I cooked the halwa on the lowest flame in my 3 burner gas stove along with my regular cooking chores,so I didn't find it daunting to stir it every now and then. Sending this to Kerala Kitchen an event hosted by Magpie and Ria. Looks yummy and so easy to make. Wow Divya, Love halwa a lot and that too banana halwa is too tempting. These look so soft & delicious!!! Liked it.. I had tried to prepare a banana halwa once , it dint come out so well, will try this one ! The halwa is looking so rich and delicious..lovely colour too. the very look of the banana halwa in the picture makes me drool.the halwa looks so simple and very tempting. B T W I would like to ask u how did u get such a nice golden colour of the halwa? did u add saffron or any other food colour? please let me know since the bananas r whitish in colour. Sounds so easy and looks so delicious,would love to taste ! Do we use the Nedrapazham for this? Gorgeous Divya! I love halwa in any form...especially fruit! Jackfruit is my favourite! This looks super delicious divvs! the only probs with the halwas is the ghee we add! 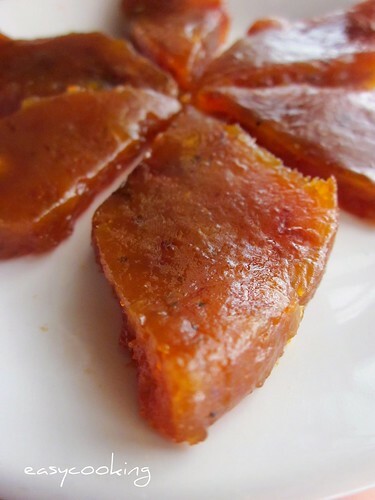 thats what halwa is, i knw that..:) this looks really tempting..i think pop one slide it goes..
Super duper Halwa Divya. when ever my neighbor who is also a keralite visits her home town she used come with loads of this halwa and she will be so generous is sharing them with me and my kids. 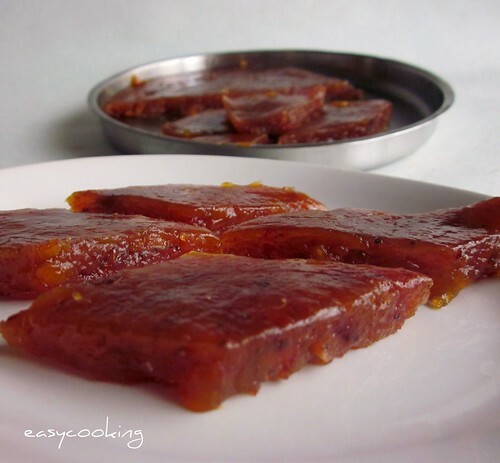 Looks tempting.must try once :)Looks like wheat halwa :)very glossy..
Wow! That looks beautiful and delicious! 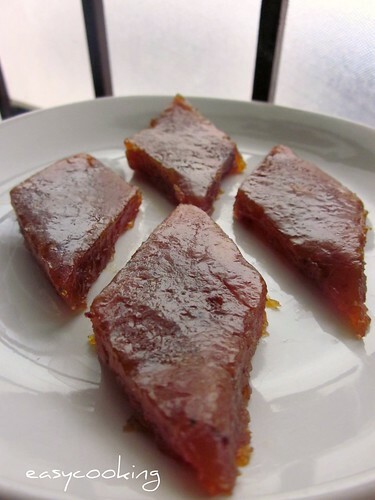 Thats a delicious glossy halwa, wat a colour..
Wow this looks awesome and delicious,healthy halwa. True,some things are easier to buy than make at home. A entire street devoted to halwa!! Now that's something!! wow, that color is so tempting dear. Oh wow Divya, I never knew making halwa would be attempt able at home! Thanks for sending it over to the Kerala Kitchen!